Pastor Chris Okotie brought a lot of attention to himself days ago when he bluntly said that a Catholics would go to hell. The failed president aspirant was photographed on the pulpit preaching with 3 hard-looking bodyguards. 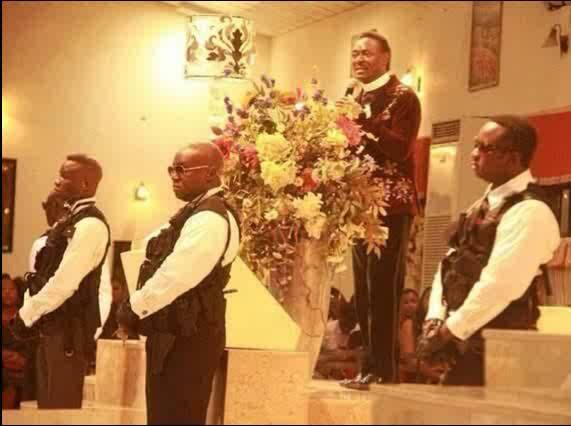 Why would a pastor need so much security? Plus correct me if I’m wrong but are those bodyguards wearing bullet-proff vests? “Your Man Does Not Treat You Right Because You Settled For It And Allowed It” – Sonia Ogbonna Tells Women. Chris is a comedian.what is he doing with all those BG?He is on stage acting.He shld visit 15 cooper Road Ikoyi or any of the catholic church to b councilled. They are not Just Wearing Bullet- Broff Vest, they are more than three and Fully Armed. The Bible will never lie. Here is a man who claimed to be of God Judging a saint. Well, time will tell who will go to hell. I pity you Mr. Pasito Okotie. Seriously, we all knw dz man wasn’t rilli ordained by God, am sorry to say dz bt 1stly he he divorced his wife “hmmm imagine a pastor doin dat not , in d bible d only reason to divorce is when d woman commits adultery” n his wife didn’t do dat , 2ndly he wanted to become a president, “we all knw dat in nigeria of today getting into politics is a very dirty act, 4 me a ordained man of God is supposed to advice our leaders nt gettin dier hands dirty in dz so called politics “, 3rdly d so-called man of God bluntly started accusing another doctrine, I find dz so funny cos cathholic church was d 1st church on earth, if he z really a good pastor he wouldn’t hve judge ani oda christian dinomination, am just wondering while those his followers still follow him with everythin dey see dier pastor do, no matter hw popular d pope is, hve u eva seen dem wif boodyguards, am really ashamed of dz so-called pastor , well goodluck, try to amend ur ways, leave judgement 4 God……..
pls ignore him he doesn’t worth all the attention that he is getting. This man aka ‘pastor dictionary’ is a clown, let him keep on entertaining us! MGBO TIPIA SIA YA ISI EBE AHU CN U IMAGINE BOKO HARAM IN CHURCH? CAN U IMAGINE THIS MAN CALLED IFEOMA I WANT TO MARRY YOU GIVE YOUR LOVE BONGO FISH WEY DO SCATTER LADIES THEN WHEN WE GUY MEN NEVER SEE TINS CORRECT COME CHANGE JOIN ABRAKATABRA PEOPLE NOW MUMU DON D WORRY YAM ATURUR MURU EBULE……………..
Why does he think all catholics would go to hell? I can’t believe this is what someone who calls himself a pastor is preaching, for the Bible says JUDGE NOT. Mr Man of God. U have done what is worste dan a comment but dis is just one of de end time pastors. Check ur ways be4 it is too late mr failed president. It is b/c of stupidness and self judge that lead him to said that, He know that hell is already prepared for him that is why those are with him. PASTOR PITY FOR YOUR JUDGEMENT B/C THE BIBLE SAYS NO ONE SHOULD JUDGE SO THAT HE WILL NOT BE JUDGE BY GOD, BUT U JUDGE THE CATHOLICS WHICH MEANS U ARE ALREADY BEEN JUDGE BY GOD. What a shame! What are these men needed for inside the house of God.